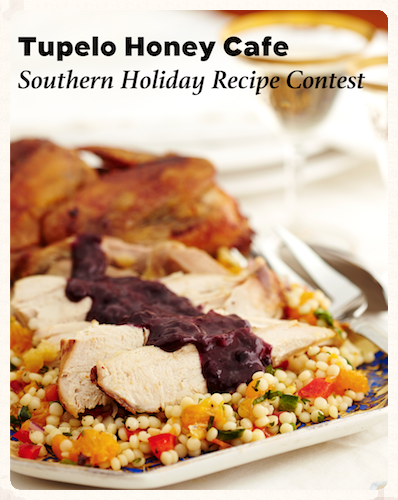 The Tupelo Honey Cafe Southern Holiday Recipe Contest is just sitting on the Internet, waiting for you to enter! The deadline is December 6. You can read about all of the details are HERE, but let me whet your contest appetite a little bit. 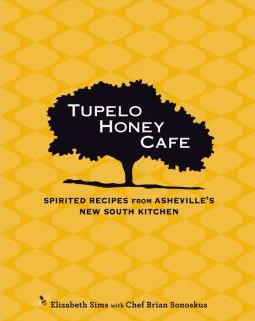 Wait--let me tell you about Tupelo Honey Cafe a little bit first. THC is an Asheville, NC-based restaurant that focuses on farm fresh, seasonal, made-from-scratch food. Not only a restaurant, THC has committed itself to be "spirited, independent and frequently unscripted." If you're in the mood for fried green tomatoes, goat cheese grits, okra, catfish, an array of fresh salads, vegetarian AND vegan options--this is your place. Located in Charlotte, NC; Greenville, SC; Chattanooga, TN; Johnson City, TN; Knoxville, TN; Downtown [the flagship location!] AND Southside Asheville, NC; and new to the family, Raleigh, NC, THC wants to welcome you at the front door with a drink in one hand and a roll of silverware in the other. Okay. Back to the contest. Sooo... There are 4 categories: Holiday Main Dishes, Holiday Desserts, Holiday Leftover Recipes and (my favorite), Holiday Cocktails! All you have to do to enter is click here, or go on Facebook or send your entry by USPS. Enter your tried and true recipe and upload an optional photo. I'd definitely upload a photo. It'll probably help you win. There will be a minimum of 10 winners. Two winners in each category, a People's Choice AND a Chef's Choice winner (or two). The prizes? Bragging rights! $50 THC gift cards! And more! Oh I'll have to look into this contest and enter! How fun! Fun! Who doesn't love honey!! Thanks for sharing! I love Tupelo Honey. Nikki, I am so glad you introduced me to THC -- we are super close to Raleigh, NC and we're planning a trip to Asheville in December! I will totally look into this contest, thanks for sharing!! What a great contest, and my favorite honey! I love entering cooking contests. This one sounds like fun! I've never entered a food contest but it sounds like a lot of fun! How fun! I'll have to put this restaurant on my list to visit when I visit the South too! I have their first cookbook, and have always wanted to visit the actual cafe. Thanks for the fun info! Fun contest. I may have to invest in the cookbook since I'm so far from them. Oh, how fun!! I need to purchase their cookbook! Maybe I'll enter the contest. I do love bragging rights! Sounds like an awesome contest to win! Thanks!